Rest for one minute after each two minute interval, and perform a total of four cycles. The workout will be 12 minutes total with only 8 minutes of work – go hard! Don't let the pixie-like appearance fool you, Baby Belle is merciless as a coach. 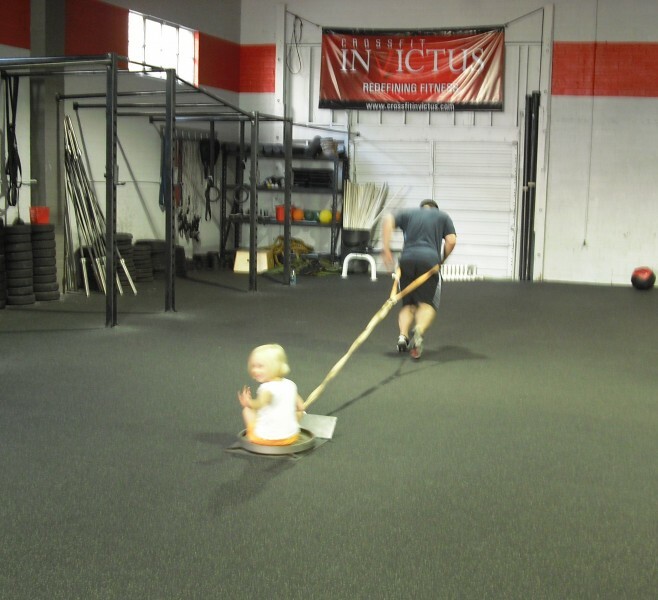 Here she adds a little extra weight to Coach Sun's sled drag. As you all know, we like to do some heavy lifting before our conditioning workouts. Typically you’ll see something like 5×5 or 5-5-5-5-5 written on the board. This simply means that you will perform five work sets of five repetitions each. Prior to your work sets, you should do a few warm-up sets to practice the movement, demonstrate you are capable of good mechanics under load, as well as prepare your neuromuscular system for the heavy work sets that lay ahead. 225 pounds should not be weight used for the first warm-up set of any exercise. If we are back squatting today and you know you’ll perform your first set of 5 at 225lbs, you’ll probably want to start off with the following warm-up sets: 135lbs for 5, 155lbs for 4, 185lbs for 3, and 205lbs for 2. This serves as a method to ensure that you are really truly capable of lifting 225lbs for 5 repetitions, a 5-rep work set should never turn into an accidental 1-rep max attempt. Remember, this is always relative to your level of strength and the type of lift we are performing. Warm-up sets serve to help improve your proficiency in any lift as well as ensure you are properly warmed-up for the loads you will attempt to lift.